In the shadow of harsh criticism from the state comptroller on the neglect of the Mount of Olives, 23 smashed headstones were discovered Wednesday in the ancient cemetery. "It is simply outrageous," said Yehezkel, whose sister S. is buried in the cemetery, to Ynet. The police said that a number of cases of vandalism and damage to be headstones have been incurred in recent months. As part of a wider investigation that has been launched into these incidents, a forensics patrol car arrived on the site Wednesday in order to collect evidence that will help locate the perpetrators. Yehezkel is convinced that "young Arab boys from nearby villages" are responsible. According to estimates, there are upwards of 60,000 graves in the 74-acre cemetery. For many years, the cemetery suffered from vandalism. Only in August 2005 did the police decide that an annual NIS 50 million (about $13 million) would be invested between the years 2006 to 2013 in the rehabilitation, development, and maintenance of the basin surrounding Jerusalem's Old City, including the Mount of Olives. The promises to reel in criminal activity on the site do not comfort the family of S., who is buried in the complex. "They wander around there all the time, and the police could make it easy on themselves by installing security cameras, something we have been demanding for quite some time," said Yehezkel. "The government knows how to make threats of coalition crises if a few graves are moved that could have Jews buried in them, while here there is a continual affront to the memory of Jews." The State Comptroller's Report, which was published Tuesday, addressed the neglect of the cemetery. "Despite the vandalism and the criminal activity in the cemetery, East Jerusalem Development Ltd has not focused on regular upkeep of the cemetery above all else, but on pushing forward the planning and implementation of an all-encompassing security plan for the Mount of Olives range, including the cemetery," claimed State Comptroller Micha Lindenstrauss. Lindenstrauss also claimed that cemetery affairs have fallen between the bureaucratic cracks in that the jurisdiction of the body responsible for coordinating cemetery activity has yet to be arranged in its regulations, and, as such, damage to the graves will likely continue. The investment of millions of shekels towards rehabilitation may be wasted. Religious Affairs Minsiter Yakov Margi said to Ynet following the report on the smashed headstones that the cabinet decision on Mount of Olives security should be upheld, or it should be placed under the authority of his ministry. "I am deeply shocked by the neglect, the lawlessness, and the lack of security that plague the Mount of Olives," added Margi. 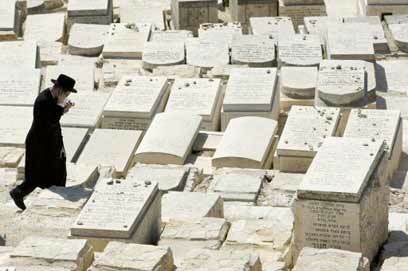 See all talkbacks "Vandalism returns to Mount of Olives cemetery"